A person who is stressed for any reason that is unconnected to cats, is going to find it harder to be a good cat caretaker. That is my assessment. I am referring to a person who is stressed because of things such as difficulties with relationships, finance or work. These are the kinds of normal challenges that often go awry. In the UK, today’s biggest problem is the stretched home budget. I know from personal experiences that when I am stressed I have less patience. I am more irritable. Feeling like that I am less likely to spend time with Charlie, my cat, or play with him or just chill out with him. I am chasing around too much to think about Charlie. I become more self-concerned; not good but human. At least I am aware of it and can therefore take corrective action. One reason why retired people are more likely to be better car caretakers is because they should have less stress in their lives. That isn’t always the case but it is more likely. Plus they are around more. Fear or uncertainty about the future is difficult to deal with. The unknown and uncontrollable future creates anxiety and that in turn causes stress. This can lead to mothers who carry the gene variant to shout more at their children or smack them more during an economic downturn. These same mothers are also more likely to be positively affected when the economy is bouyant. They are also more likely to lower their standards of cat caretaking, I would argue. The gene variant creates a personality trait. That is how I read this research. I am not sure you even need a certain personality trait to be affected by an uncertain future. Stress nearly always comes down to a lack of control over one’s environment and life. Economic uncertainty has a profound effect on the life of a family. In the UK there are millions of families who live on the edge financially, with no savings. If interest rates go up they pay more in mortgage payments, which may be enough to tip the family over the edge towards having to sell the home or worse the home is repossessed by the bank (the lender or mortgagor). What I am saying in a roundabout way is that there are many cats in homes who will also be feeling the effects of financially uncertainty, indirectly, from their human companions. As is the case for having children, when deciding to care for a cat or cats people should always make sure they can commit to it for the life of the cat. It can cost something in the order of £10,000 to keep a cat over the cat’s lifetime inclusive of all expenses. In the UK, on average, it costs £222,458 to raise a child to aged 211. This entry was posted in ailurophile, ambivalent, human stress, Human to cat relationship and tagged cat caretaking, human to cat relationship by Michael Broad. Bookmark the permalink. Well I don’t mind a walk out in the snow but I’m not crazy like my bro sitting in it, I’d rather look out at it. 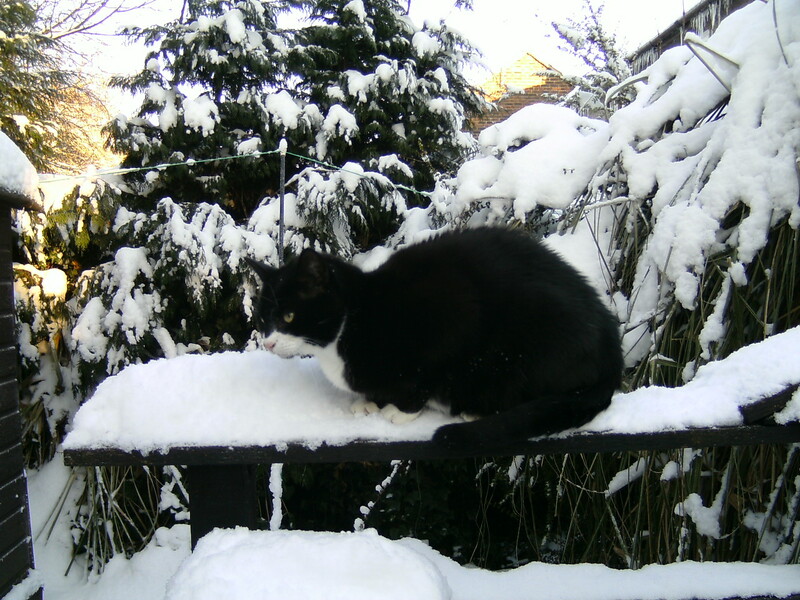 Jozef looks perfectly at home in snow and he looks good in snow too. I agree – I mean i don’t want to be in a relationship necessarily because it will invariably stress me out and then the cats won’t get the attention and fun they need from because they are locked from going further than my balcony. If I was able to let them outside to roam freely it would change everything. Are they enjoying their catio Marc? Yes they are – relatively speaking. They spend almost all the time out there. Molly is sleeping out there at night and in the day – its like a TV for them or something. Yesterday I closed it for the first time because we had a storm that involved alot of wind – plants getting blown over etc. They seemed a bit lost when I closed it. I wonder how they will be when it cools down and is less inviting out there. Molly will probably stay out there anyway like Red did – it runs in the family I guess. I think they will get used to the cooler weather, Marc and want to go out there anyway. 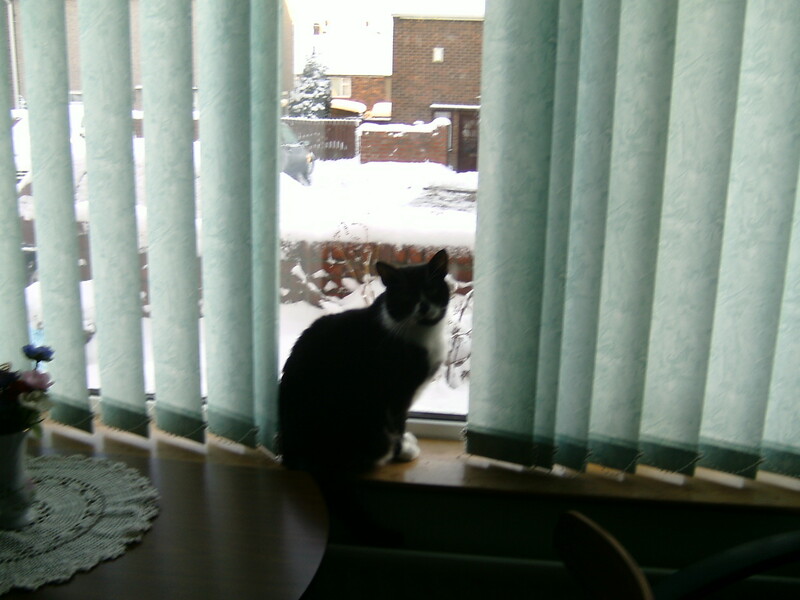 I’ve read that cats exposed to a variety of temperatures shed less than cats kept in a constant temperature indoors. The full time indoor cats end up shedding constantly. Some cats are more interested in getting out to nature than others. Charlie likes going out but he does not go further than about 30 yards from the back door and spends 95% of his time indoors, contented. The catio is a success, it seems to me. The catio does sound a great success! 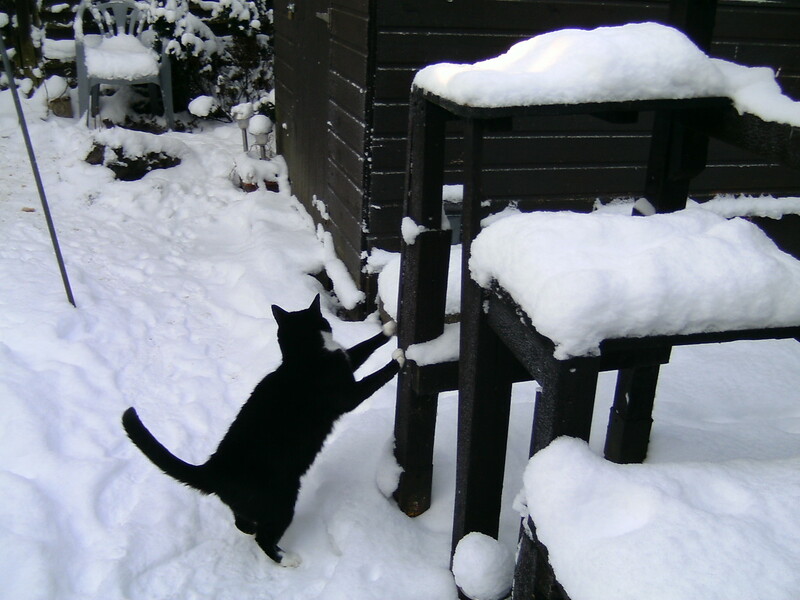 Walt and Jo still go out even in the snow, they don’t stay out as long as in the good weather but Jo especially as he was born half feral loves to be outside. I would hate to have to try and keep them indoors always, their stress and ours at seeing theirs would be unbearable. That is a good picture Ruth. Black and white but in color. Love it. Good point. If your cats are stressed for whatever reason that affects you. It is the same for me. Me and my cat feed off each other. If he is stressed so am I and that can make things worse. I tend to manage those moments to keep him relaxed as I think Jane does (Everycat). I’m so glad your cats like it Marc it has opened up a new and interesting world for them,it’s a great thing to do for cats where it’s dangerous outside. I will have an increase in stress as I have had to take a job teaching music two days a week in an inner city school. There wasn’t enough work in physical therapy anymore. Teaching is higher stress and I will have work to take home as well. But financially it is good because if I didn’t work a single day as a PTA all year, the teaching gig is enough pay by itself for us to just make it, assuming no emergencies. And I will make enough additional income for emergencies. But I’ll be at work more, gone more for the whole day, and busy with lesson plans, composing and practicing music. Monty does like to help when I sort and file papers, so there will be some of that to interest him. And so long as he gets outside at least once a day, most days of the week, he is happy. Playing with him can be a way to combat stress, but I have to find that balance in life– put the paperwork down and pick him up once in awhile. In some ways I feel less stressed because I feel needed again and I feel self sufficient because I was able to find enough work in a terrible economy. Every job I applied for had literally hundreds of applicants. It was disheartening. I think the stress from working a lot is probably less bad than the stress from not being able to find work, for me. The opposite might be true for Monty since I will be gone more than when I was sitting here unable to land a shift anywhere. But Monty was never in danger of lacking anything– I’d have gone hungry before he did. Not everyone cares about their animals as they should. So economic troubles are often worse for a cat than just having a busy human who is off making money. but I have to find that balance in life– put the paperwork down and pick him up once in awhile. You are very aware and able to cope. That is the point. It is when stress dictates ones actions that a family cat can lose out. Yes stress most definitely affects cats and so does bereavement, the only difference is they grieve like we do, but just for a while then they accept that the person or companion has gone and get on with life. Walter and Jozef grieved for a while for Popsy when she died, then the following year for Ebony, but as always cats accept everything that happens because they have no choice. We humans waste our time protesting against fate and would be better off following the example of cats but of course we don’t, I still shed tears for all the cats I’ve ever loved. Ruth, do you ever get stressed to the point where it affects Walter and Jozef? I somehow think not 😉 But it might happen. Yes we could affect them if we didn’t stop ourselves from being stressed when they are around as they do pick up on our emotions. When Barbara’s John was very ill then died we were naturally devastated and Walter started spraying because he missed him too and his cat Popsy had come to live with us and his secure happy world had fallen apart. Cats give us comfort at those times but at a cost to themselves, Jozef started over grooming. It’s awful that the bad or sad things in life affect our cats too we can’t stop fate so we just have to try to keep things routine and stress free and happy for them as much as we can. That is interesting to me. It seems the whole family was stressed, you, Barbara and the cats at that time. Do you think you and Barbara passed on the stress because it was impossible not to or did the cats feel it as you did? In other words because of the change in the home? 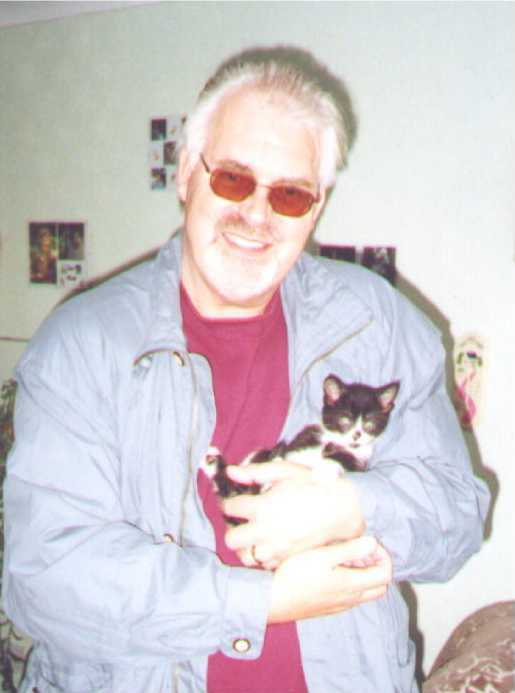 It was a huge change for our cats, they loved John as he was here a lot and Walter did especially because he liked men, Ebony was and Jozef is more of a ladies cat. We think that in his mind he thought that John disappeared and Popsy took his place so he blamed her, he didn’t get along with her, our whole house was out of kilter for a while. So losing John affected us and all our cats too for a while, Barbara most of all of course as she’d lived at the hospital with him for his last week and was widowed on her 49th birthday. It was a horrible time and I sometimes wonder how we lived through it. I’ve seen cats behave in very stressed ways when there has been illness in the home too. When the cat carer is ill and has to have people come in to care for them. It upsets the equilibrium of the cat’s life quite severely. It seems that the animals end up at the bottom yet again. Shelters everywhere in the UK are full to the brim with dumped animals. People are giving up their pets, seeing them as a commodity to be dumped when they lose work, suffer reduced income etc. I don’t see these people dumping their children. Jane, you are a smart lady. 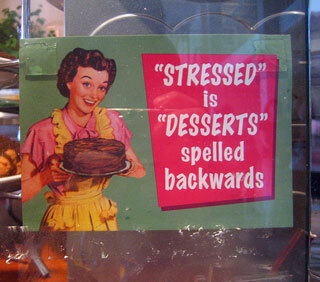 Do think that when you are stressed you are less able to cope with all the demands in your life? If so your cat or cats may get less attention. There are times when I fail my cat due to my own failings. Even excellent cat caretakers may become poor cat caretakers if they are badly stressed for any reason. Undoubtedly Michael this can happen, but I would like to think that I have met the needs of animals when I have been in the role of human carer. When I was nursing my Mum through her final illness, I had to marshall (get rid of) abusive home carers, fend off leech like spiritualists, stop a cleaner trying to hurt one cat and co-ordinate everything and do everything concerned with her care myself. There were also about 20 billion other nightmares happening in that scenario which it wouldn’t be appropriate to reveal here. I’d like to think that I did ok looking after the cats and dogs they included animals with special needs, ex-semi ferals, and one geriatric, plus one little dog who had had a stroke. The people who were most helpful in this nightmare scenario were actually the vets as all the animals had on going medical needs which had to be addressed. I needed 8 arms and about 60 hours in each day I can tell you. Yes, the attitude of the carers caused my Mum and me a lot of stress, they particularly hated the cats. I kept the house immaculate (fired the cleaner who was stealing from my Mum too) and just did what was needed, but animals, being so sensitive picked up on everything. I pride myself that the animals got better care than if I had not been there at all. Situations like this are very complex, and it is not possible to suggest judgement on situations like this. Every case is individual and I know that everyone here is more likely than not to acknowledge when they have failed an animal. One cat blocked the day I arrive. I consider that a failure, but he was at the vets before I started tackling the ghastly vortex of incompetence and malice that seemed to form my Mum’s “care” team. In situations like this, you take your eye off the ball for one second and you have a train wreck. Animals are always the priority for me. For other people, the assumption that everyone just puts the animals at the bottom of the priority pile might be apt, but for me it sure aint. None of us are psychic, and I know I have missed things with my own cats on occasion or not pressed vets to take action. We can’t control everything in our world, we can only do our best. Jane, you are pretty special person by the sound of it. You are very disciplined and can deal with stress and maintain standards. That is at least partly what makes you an excellent cat caretaker. A lot of people just “lose it” and the cat suffers. With respect to the research referred to in the article, it seems to me that you are one of those people who do not carry the “gene variant” mentioned! Michael, I was “lucky” in that I was raised by animal loving parents. Our little family always fostered for the RSPCA and the PDSA and we also took in many animals that were just dumped on us. We rented a field and had a little yard complex where we also had, over the years – goats, sheep, rabbits, guinea pigs, ponies, donkeys, horses and on one occasion, a cow and her calf. Back in the 60s and 70s, both those organisations were there 100% for the animals. The rule was: The animals come first, because you can look after yourself, they, cannot. It has stood me in good stead for coping, but I am just human like everyone else and I try to keep my meltdowns away from the animals. After Mum died, I did fall to bits rather, but it was caring for the animals that kept me sane and alive. I think that giving care to animals is a valuable therapy. They always give so much back. They are SO much easier to be amongst, than people ever are. I hope I don’t have that awful gene! When I see children being walloped around by adults, I find it very distressing. Asda car park on a hot Saturday afternoon is like a festival of toddler walloping. Social Services could have a field day.